The Zappi 7kW EVSE is apparently available for pre-order from evolutionaustralia.com.au priced at AU $1099. Expected to be available in limited quantities in early September. i am particularly interested in this product because it promises to be a neat means of charging an EV solely from Solar PV generation. We have up to 10.08 kW [peak] solar available. I have read a few earlier posts where people have sourced this unit directly from the UK. Has anyone been yet able to purchase one from an Australian supplier? To those that already have one: what has been your experience to date? Last edited by rhills on Thu, 16 Aug 2018, 13:29, edited 1 time in total. Reason: Edited by Admin to make web link clickable. Those guys are corporate supporters of the AEVA - so hit them up for a discount. The first video is a lengthy and fairly technical overview of the whole system, while the second provides more of a user's perspective. I have an OpenEVSE three phase unit. Max 30kW but I only use 22kW for the Zoe. Handles single and three phase. It has inbuilt WiFi and is its own AP when no WiFi around or connects to a defined AP if there is one nearby. It links easily to EmonCMS (this took only 60mins to set up). Max 40amps per phase. It also has solar integration so that once your solar export exceeds a predefined figure, it starts charging your EV. It then manages the current available to the EV as solar production increases or decreases. It will not go below 6 amps because otherwise the relays would cut and re-engage too often shortening the life of the EVSE. In other words, once it starts charging, it continues even if the sun goes out. I have not yet installed enough solar (but will soon) so I cannot comment on the effectiveness, but it works for other people. You can also set the unit to start and stop at predefined times. There is also a setting to stop after a predefined number of kW have been delivered to the EV. Hello, I was lucky enough to find a Zappi on ebay when I purchased my Model S. The charger runs at about 22 kw as it is on single phase power. It is a great unit and works really well. There is a lot of satisfaction in knowing that instead of returning power to the grid, you can run your car on all solar. I would thoroughly recommend getting one! At first I also bought a simple portable EVSE from Evolution Australia. They were excellent to deal with and the unit came super fast plus worked exactly as described. It is a single phase unit settable to 10A, 15A, 32A. Totally waterproof. You change settings by shaking it vigorously when first turned on. Displays amps, volts, kWHrs & setting status. Another member here, also with a Zoe, bought the 6A, 10A, 15A version and he also is happy with that. My OpenEVSE uses my standard Zoe cable to save too many cables (it has a Mennekes socket on the front). I too support Open Source where I can; I run various flavours of Linux on each of myPCs. The OpenEVSE looks the goods but I've not been able to find it from an Aus supplier. After some previous experience with imported electrical/electronic gear I'm wary of items that may not meet Australian Standards or regulations. For the past 6 years we have had 3.6kW of solar panels. Partly to charge the proposed EV and parly because our ageing Off-peak hot water needs replacement, we recently upped our solar PV to 10.08kW. Have also connected an LG RESU10 (9.8kWh) battery. The idea is to now replace Off-peak with a heat pump, thus minimizing our connection to the grid. Not quite off-grid, but the closest thing to it. In a very small way we hope to help drive Coal Fired generation to extinction. After some consideration of available EVSEs, I have placed the Zappi on pre-order. Zoe purchase is still a month away. Have also bought a 'granny cable' (10A) to trickle charge at homes of family and friends . Though we have 3phase supply, the original inverter is a string single phase and the new one is single phase Hybrid (to interface with the battery). We are retired, and do not require really fast home charging. 32A max charging current of the Zappi from single phase is ample for our needs. Zappi appears to provide a simple set and forget solution. The Zappi might give us that inner glow that comes with knowing that the EV is totally running on sunlight. Hi Lou, those solutions sound excellent. The inner glow will add to that you get when not spewing out exhaust in tunnels and at traffic lights. There is no way you need a whopping big EVSE in your garage so you'll have no problems. My three phase one is for long trips (tried it at a showground with 3PH 32A yesterday) and for solar integration once we have the solar. But for solar, it will be running fairly low amps during times of excess. Our constant consuming devices are a server, a CCTV system and various backup servers. I converted all of these to run off 12VDC with integrated UPSs and limited battery storage with shallow cycling of AGMs. I have a few hundred watts of solar with three MPPT chargers (I have always designed and built my own MPPTs since 2004- keeps costs low). These have been super reliable and now saved their cost and I'll look to integrate them into an Enphase AC solar system. Wow! Your Model S must be capable of return journeys to any point in Tassie on a single charge. Tasmania must be the ideal state to own an EV, with reduced range anxiety and with the grid mainly fed from green hydro. How long does it take to charge that huge battery from the Zappi? Hm, 22kW single phase is around 100amps. Not sure where one would find such an outlet, but perhaps Tassie has something unique. I would like to see the connecter. It clearly is not Mennekes because the biggest one of those is 63amps. Also, I thought max AC charge for a Tesla was around 18kW not 22kW? Zoe is 22kW or 43kW if you have the Q90 (in Europe). 22kW is normally three phase. So perhaps a decimal point is missing? I got the Zappi installed and have had a go with it, charging a Renault Zoe. Like the curate's egg, It seems to be good "in parts". It appears to be charging OK in Fast Mode, but I don't think it is working properly in the other two modes, i.e. ECO and ECO+ mode. The Zappi screen says it is, but the last time I tried it showed the EV being charged at 7.4kW in ECO+ mode (supposed to be 100% from surplus solar) when the solar inverter can only produce 5.0kW max. Clearly someone is fibbing here! It could be that the Zappi is confused by my house electrical setup. It is 3 phase, with a single phase solar inverter on each of 2 phases and mainly Off-peak HW on the third phase. To possibly confuse it even further there is a house battery on phase A. In ECO and ECO+ modes the Zappi is being controlled by data harvested by a CT connected to a Harvi (wireless unit that does away with the need for twisted pair cabling between CT and Zappi). I'll be doing some testing of CT and Harvi device to determine if they are working properly, and also go carefully through all the settings on Zappi to see if I've missed someting. I am also off grid with a LEAF and have been dreaming of a solution for quite a while. See viewtopic.php?t=5122 for some prior discussion. After a couple of weeks of using the Zappi EVSE to charge our Zoe, its now possible to provide an interim assessment. There is no doubt that it works well in the setup it was originally designed for. That is: where there is a single phase power supply, with solar PV (or wind) generation connected to the same single phase. In this situation, it allows an EV to charge in all 3 available modes. These being: FAST, ECO and ECO+. The single, supplied, Current Transformer (CT) is sufficient to ensure that it works to spec. in ECO mode and that in ECO+ mode the Zappi can be set to charge EV solely from the surplus solar power that would otherwise be exported to the Grid. 1. The CT is not hard wired to Zappi but is instead connected to an Harvi wireless (868MHz) transmitter that then sends import/export data to Zappi. 2. A house battery is connected to solar PV. 3. Mains supply is 3 phase. 4. The inverter is 3 phase type. My setup covers conditions 1. to 3. I have CT connected to Harvi, a battery and 3 phase suppy. However, my hybrid inverter is single phase. With my setup the Zappi EVSE works, at least to some extent. FAST mode is fine. In ECO and ECO+ modes Zappi cannot distinguish between surplus solar power and battery charge. What happens is: because the battery maximum charge discharge rate is 3kWh, Zappi allows the EV to charge at 3kWh plus whatever is available from surplus solar, up to its maximum charge rate of 7.4kWh. Unless I’m paying close attention, the house battery can get very low before sunset and then we’re drawing from the Grid for the rest of the evening. I have managed to charge Zoe with a minimum 97% green energy (according to the Zappi LCD display) by only charging the car during morning hours and allowing the house battery to recharge in the PM. This is only feasible because I’m retired and do not have to drive to work. According to myenergi.uk connecting a second CT should fix this. That brings me to another peeve. The User Manual for Zappi contains several errors and omissions. Some of the info even seems to contradict that in the Eddi and Harvi manuals, from the same manufacturer. Before clamping on additional CT(s) I wanted to get some clarification on how best to proceed with my particular setup. To date I have not received a reply to the email I posted over 2 weeks ago. Yesterday I tried again, this time to a second email address. I will wait another week before trying to phone them. I understand that they are a small company and probably very busy, working on their promised fully integrated 3 phase system and so on, but they certainly lack customer focus. They do not have an automated message aknowledgement system or even a support tab on their website. Others on OS forums have already commented on poor level of communication and support. Note: where a 3 phase inverter is installed dgh853 has already documented that Zappi simply does NOT work as intended in ECO or ECO+ modes. Hi Bryce I actually purchased the Zappi, together with Harvi and a couple of CTs, from Russ at EVolution. I did send him an email with feedback info, but have not heard back yet. We have had a couple of phone conversations, in the past, so I will try that route again. Thanks for the heads-up re: Oct-Dec issue of EVNews. it has not yet landed in my inbox so I got a copy from the AEVA website. In my opinion, the Zappi EVSE is great in concept but sorely needs some development and a much more thorough User Guide to cope with the intricacies of real-life installations. I have now managed to get my Zappi EVSE working properly. It behaves as per specs when charging the EV in each of the 3 available modes: FAST, ECO and ECO+. After much mucking about with the wireless Harvi setup and getting either weak or lost signals, I tested it by extending twisted pair between CT sensor and Harvi with Cat5e cable. Long enough for Harvi to be inside the garage and in line of sight of Zappi. The whole shebang then worked OK.
As it made no sense to be using wireless with the two units only a couple of meters apart, I decided to bite the bullet and hard wire Zappi directly to CTs with Cat5e. It is now all working well. Communication appears to be not only more robust, but also faster and more precise. Evidence is that Harvi actually works as intended but seems that it (or sensitivity of the transceiver in the Zappi) is not up to penetrating the several layers of masonry and steel framing between the switchboard and the EVSE in the garage, on the far side of the house. With charging mode set to ECO+ 100% Green, it now charges the EV strictly with only surplus solar energy. It no longer gets confused and doesn't draw down the house battery. 1. a current transformer (CT) clamped on the main grid supply cable; this is what measures energy being sent to Grid. 2. A NET meter to the property that sums all energy flows between house and Grid, including across 3 phases. 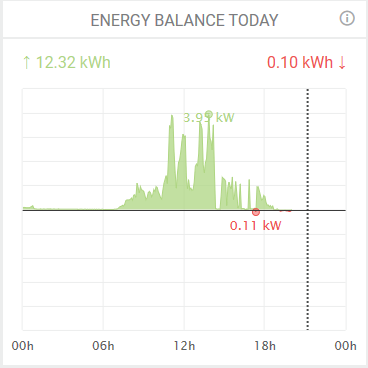 I woud think that without connection to Grid, Zappi would only work like any other simple EVSE. That is: it would draw up to 7 kW provided it was connected to 240VAC 32A circuit. This is basically what it was doing while I was having problems with Zappi to Harvi communications. It was drawing all the power it could by combining what was being produced by solar panels with what the house battery maximum discharge rate allowed. I could have got the same result from a simple switchable EVSE set to 20A. So the short answer is: unless myenergi brings out a completely redesigned version I don't think it makes any sense to use Zappi in an off-grid situation. On the other hand, if you are thinking of powering the house from the EV battery, there is a rumor that myenergi is looking at this as part of their promised (should be very soon) upgrade. It might be useful in an AC coupled system, where the aim is to charge the car before letting the Solar charge the house batteries. Matthew is correct. Zappi will measure input/output from an AC coupled battery. The Zappi user manual shows the settings necessary for this to happen. It only requires installing yet another CT ($35 AUD). But, I can't see how it would help in an off-grid setup. In my case, with an DC coupled battery, current flow to and from the battery is invisible to Zappi. To even register this current, let alone do anything with the readings, Zappi would have to incorporate non-invasive DC current sensors such as Hall effect transducers or DCC Beat. I can live with shortcomings of Zappi because my/our needs are basic. During early morning hours Zappi display shows zero values for Solar Generation, House Consumption and Surplus Solar Export. This is because solar is fully committed to recharging the house battery and this part of the process is not measured by the two installed CTs. Once the battery is fully charged, the display shows all 3 measurements. In our latitude, on average sunlight days, this happens once Sol has been up for approx 2 hours. That's when it's OK for the EV to begin charging, with the assurance that it will only be charged from surplus solar. I admit that getting Zappi to work properly, in an off-grid setup, is just beyond me. Perhaps others, with more electronics knowhow will take up the challenge. I have recently installed the Zappi at my place which has a 3 phase supply using a 3 phase Elster A1100 nett utility meter. The zappi was installed using a Harvi and three CTs. Under advanced settings, Supply Grid, Export margin is set to the maximum value of 900 watts. But yet despite this setting the Zappi is nett exporting close to 0 watts instead of the expected 900 watts. 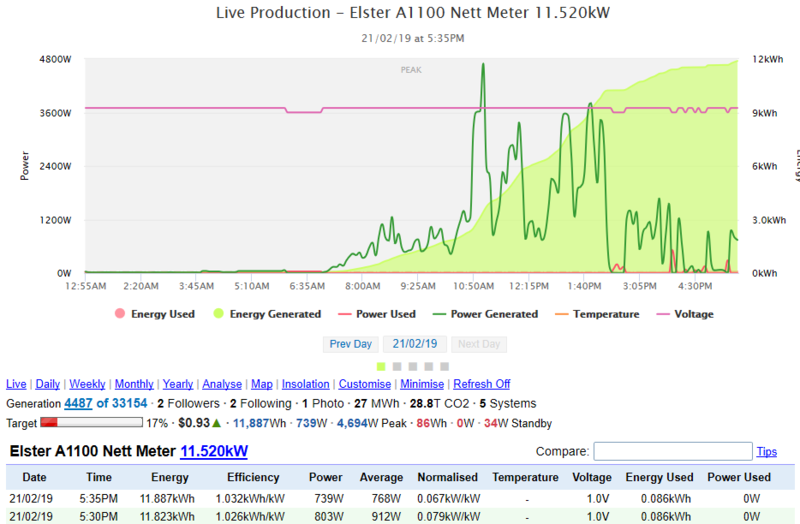 You can see that my Elster nett meter logging is importing from the grid although as small as it is 0.086 kWh, I want to decrease it to zero kWh import as advertised. My Zappi is set to ECO+. So on sunny days I get 100% green power and on cloudy days when sunlight is broken by clouds I get 98% green energy. I also have a Fronius 3 phase Smart Meter which also does data logging. You can compare results. The Arduino data logging is more accurate as it uses data logging values given by the Elster A1100 meter through digital communications of the infrared port (IFrD port). Export Margin: 900w (900w is the maximum export margin setting) - I have emailed to support@myenergi.uk asking why this setting makes no difference as export is always about zero watts. Still waiting for a reply. Above is data logging done by my Fronius 3 phase Smart Meter which can be used to compare with data logging from the Arduino. The sections coloured in grey is the consumption of the Zappi EVSE.